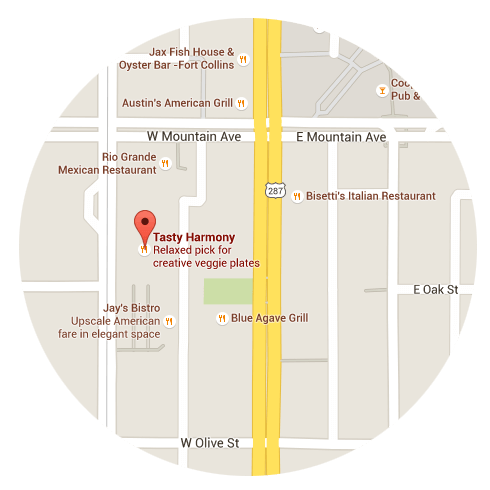 Tasty Harmony is committed to provide our community with healthy organic plant based cuisine. 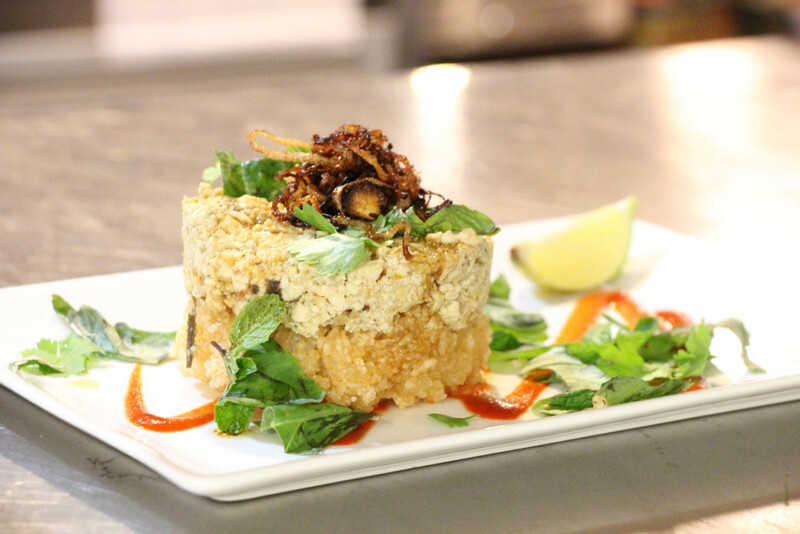 Most of our food is vegan and most of our desserts are wheat free and sugarcane free. Though we may not be able to always use 100% certified organic ingredients due to unavailability or cost effectiveness, we will always strive to bring you the best that nature has to offer in a creative and tasty way. * If you have a nut allergy we urge you to not eat here due to the amount of nuts we use in our food. Our apologies. Seasonal rotating pickled vegetables, roasted nuts and seeds. Layers of our homemade cashew cheese, black beans, guacamole, vegan sour cream and salsa piled on top of corn chips. Check out our facebook page or give us a call to find out what our amazing soups are today! Black beans, roasted corn, pickled carrots and red onion, tomato, celery, cashew cheese and avocado on a bed of spring mix and topped with tortilla strips and avocado. Comes with Chipotle Ranch. Mixed baby greens, shredded carrots, shredded beets tossed in the house dressing. Crisp romaine tossed in a homemade vegan Caesar dressing with capers and carrot flax croutons. House made rice, bean and soy patty blackened with Cajun seasoning, onion rings, blue cheese or cashew cheese, roasted jalapeno, tomato, lettuce, pickles, 1000 island, “steak” sauce, toasted roll. Battered and fried tempeh dipped in hotwing sauce, shredded cashew cheese, coleslaw, pickles, tomatoes and red onion in a whole wheat tortilla. Sliced seitan, grilled onions and peppers, melted cashew cheese, toasted hoagie roll with au jus dipping sauce. Stir-fried vegetable medley in a thai style coconut curry sauce, brown rice, peanuts, mung bean sprouts. Large version of the starter. Daily steamed veggies, daily steamed greens, daily beans, brown rice, sea vegetable salad, cultured cabbage and your choice of dressing. » Choice of dressing: House, Caesar, Chipotle Ranch, Almond Krisna, Sweet Chili, 1000 Island, Gravy, Greek Vinaigrette, Au Jus. Black beans, brown rice, cashew cheese, grilled onions and peppers, roasted corn, guacamole, pico de gallo, shredded lettuce, vegan sour cream. Quinoa/Millet, Grilled Tofu, Daily greens with Caesar dressing. Mashed potatoes, grilled seitan, gravy. Almond milk, raw cacao, almond butter, frozen banana, dates and raw honey. almond milk, mixed berries, raw honey, cacao, baobob powder, flax oil, goji berries, spirulina, Irish moss, sea salt. Almond milk, peanut butter, Dandy Blend (Dandelion “Coffee”), honey, raw cacao, ice. Fresh o.j., mixed berries, banana, rice milk. Double shot of espresso, choice of milk (soy, rice, coconut almond) Ice. almond milk, frozen mixed berries, dates, vanilla, agave nectar, ice. O.J., apple juice, kale, spinach, banana and spirulina.